I named it the Terri Choker for the gal that requested this tutorial. She's new to beading, and like the rest of us, has already found out how fun and addicting beading can be! Thanks Terri! That said, let's get on with the tutorial! This choker is done in two parts. 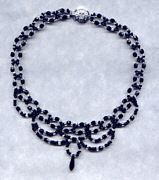 The first part, the main part of the choker is single needle right angle weave (RAW). After I finished that, I went through it again and added the loops. Clear silver lined size 8.0 seeds. Thread needle with about 6 or 8 feet of Nymo. Be sure to stretch the thread before using, otherwise it will stretch on it's own after you're done, leaving you with a sloppy piece! Now go back through (around the circle) the S, C, S, and 3B. With your thread coming out of the top of the side connector beads (marked in red) string on *1B, 1S, 1C, 1S, 4B, 1S, 1C, 1S , 1B and go BT the two side beads in the same direction so that you have made another circle. Then, following the circle, go BT the B,S,C,S,3B so that you're coming out of the top of the two side beads again. Click here to go to next page for directions on adding the loops. Or read on for more information about RAW. Right angle weave is an easy, fun and very versatile stitch that can be done with any number and size of beads. Play around with making the circles! Try using bugles for the top and bottom of the circles, or use only one bead on the side as a connector instead of two like I've used here. You can do this stitch by threading each end of the thread through a different needle too. I'm too uncoordinated to do it that way, but alot of people find it to go much faster. There's real good directions for doing two needle RAW here. For more examples of what can be done with RAW, go to my Picturetrail album site and look around. I've done alot of different designs using this stitch. Here's another great site for RAW. Play with it, and see what you come up with! And remember the most important thing.....Have fun!!!! Since doing this tutorial, I've started to use Fireline fishing line for all my beadwork. You may love it too, or you may hate it. But it's worth a try. It's billed as the 'World's Strongest Line", so I feel much more confident that my pieces won't break, especially when using anything larger than seed beads.